Honoring the legacy of Maria Irene Fornés, mother of Latinx theatre, the annual Fornés Playwriting Workshop aims to pass Fornés’ unique writing style on to a new generation of Latinx theatre artists. 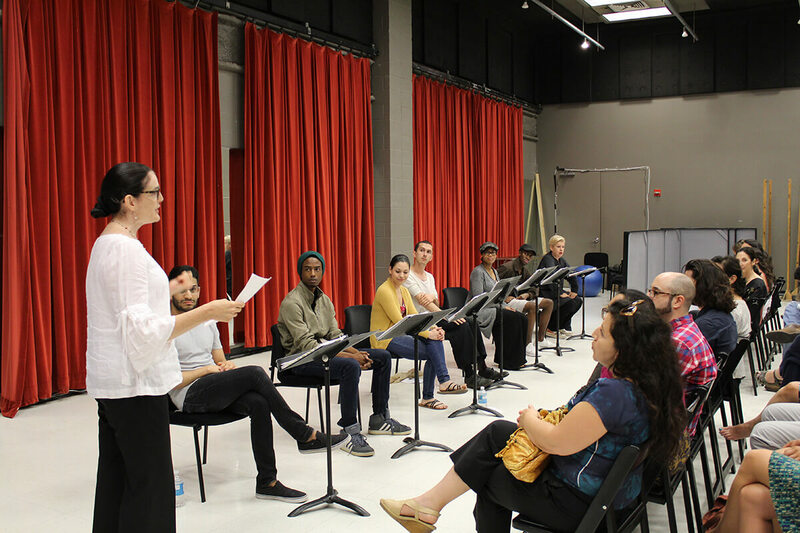 Conceived by Anne García-Romero, an associate professor in Notre Dame’s Department of Film, Television, and Theatre, this weeklong workshop in Chicago brings together 14 writers from across the country to work intensely with award-winning playwright and Fornés protégé Migdalia Cruz. Cruz guides writers through seven days of workshops in Fornés’ method writing. The week’s workshops and writing exercises culminate in the writing of five-minute scenes inspired from participants’ workshop experiences. A director, actors, and a producer are hired to present a reading of each scene at the end of the week to an audience. This year's reading was presented at the Tony-Award winning Goodman Theatre in Chicago, directed by Cheryl Lynn Bruce. In 2013, García-Romero, founding member of the Latinx Theatre Commons, met with other Latinx Theatre artists to discuss how this national advocacy group could change the narrative of Latinx theatre in the U.S. and pick up where many 20th-century initiatives to support Latinx theatre artists left off. “We all know it’s a very complex community, the Latinx community in the U.S. U.S. Latinx Theatre artists are vastly diverse culturally, aesthetically, so we felt like that was not known in the wider American theatre and so we wanted to help change the narrative so that people could understand in the 21st century how complex and rich and diverse the Latinx theatre community is and what we have to offer,” Garcia-Romero said. For García-Romero, the sharing of Fornés’ legacy and pedagogy through the creation of the Fornés Playwriting Workshop was a logical place to start. In addition to the creation of the workshop, García-Romero has also recently published a book on Fornés, The Fornés Frame. The Institute for Latino Studies is honored to continue to be the key sponsor for this annual workshop as it works to continue the tradition of Fornés and promotes Latinx leaders in the theatre community. The powerful impact of this workshop has already been demonstrated through the work of Lucas Garcia, who currently works in Chicago as a writer, dramaturg, playwright, and poet. Garcia also volunteers at the Alliance of Latinx Theatre Artists (ALTA) an organization that seeks to provide professional development, community, and advocacy through volunteering and providing member services to theatre artists Latinx Theatre Artists, specifically in the Chicagoland area.